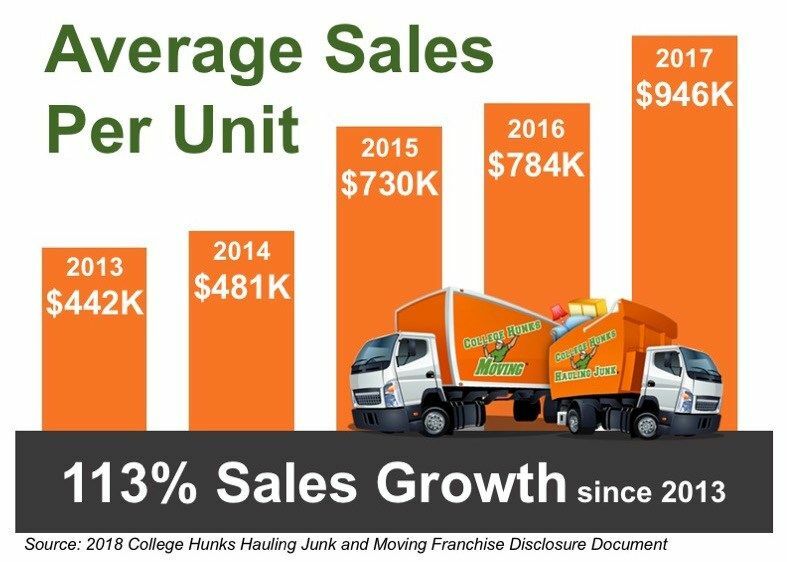 College Hunks Hauling Junk is the fastest-growing junk hauling and moving franchise in America. College Hunks Hauling Junk has been named one the fastest growing companies in America by “Inc.” and has made “Entrepreneur” magazine’s list of top franchise opportunities for five years in a row and counting. As a College Hunks Hauling Junk & Moving franchise owner, you market the business in your community and provide leadership for your teams — you don’t spend your time hauling junk or moving couches. Your team handles the heavy lifting, while you teach them business skills and teamwork, molding employees into leaders. The entrepreneurial culture of College Hunks Hauling Junk & Moving — from new employees all the way through to managers, franchisees and corporate staff — is one of the secrets of our brand’s growth and ongoing success. Another secret to our success is our catchy name and bright orange trucks, which draw a lot of attention to the brand. We’re an attention magnet, withCollege Hunks franchisees standing in front of their truck customers frequently walking up to franchisees’ trucks to learn about the business. We’ve been featured on The Oprah Winfrey Show, ABC’s Shark Tank, CNBC’s Blue Collar Millionaires, HGTV’s House Hunters, AMC’s The Pitch, Bravo’s The Millionaire Matchmaker, TLC’s Hoarding: Buried Alive and Fox Business, as well as in The Wall Street Journal, The New York Times, USA Today, Time magazine, The Huffington Post, Forbes, Inc. and more. We teach franchisees and their employees traditional and guerilla marketing tactics to drive customer interest and acquisition, and we provide digital marketing to drive customers to franchisees, as well as a national call center to book jobs. This support ensures top-shelf customer service for callers and online inquiries, and allows franchisees to stay focused on building their team and providing “WOW” customer service.